With so many products on the market, it can make finding your next fishing rod incredibly difficult. In actual fact, it shouldn’t be such a complicated process. To make it easier for you, we compiled a list to find the best telescopic fishing rod. What’s the best telescopic fishing rod? The Plusinno Telescopic Fishing Rod is a great little retractable pole. It is perfect for a pole that you want to keep in the back of your car, or bring with you camping so that if you find a situation with some good fishing you can always be prepared. It has a nice simple design and look to it, and it can hold up to more than one would think. When you buy this pole you will notice it comes with not only the fishing pole but also a very convenient little carrying case. The case is made of a black cloth material and is fairly good quality. It definitely will not tear while you are carrying it. If more room for a reel in the bag it would be better, but it does work fine as is. This pole is incredibly lightweight which is one of its greatest advantages. Regardless of weight, this is no flimsy pole. The carbon fiber and fiberglass that this pole is made with will ensure that it won’t snap while reeling in a decent size fish. It would be a struggle to find a fishing pole of this quality, ease of use, and portability for this price elsewhere. A lot of retractable poles tend to be easy to snap or break, but that did not seem to be an issue with this one. While this is not for catching monster­sized fish, it is more than adequate for a standard day of fishing. Setting up this rod is no challenge, just remove it from the carrying case it comes with, adjust it to your preferred size, which is very simple and it locks tightly in place and attach a reel. This brings us to the only big disadvantage of buying this rod which is that it does not come with a reel. Attaching a reel is very simple, just slide it on and tighten it down. the reel will stay securely in place, you definitely do not need to worry about it popping off while fishing. Just like everything else on this fishing rod, once it is tightened securely in place it will not come off until you take it off. 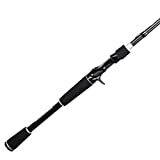 This is an overall great fishing pole for casual use with all kinds of fish up to medium­small sized fish.You don’t want to use this for anything huge, but that is not the intent of this product. 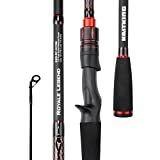 It is a great pole to have for when you want to take friends or family out fishing for the first time because it is so simple to use, and it will not take up the extra amount of room to bring with you as bringing a full­size standard fishing pole and the easy setup makes it no more of a hassle than bringing a normal pole either. This is a great pole to get started with, and when you get better at fishing, it is still great to have a travel pole. This convenient little fishing pole made by Goture brings a great mix of portability, and quality functionality for saltwater fishing to the table. It is a small retractable pole that when at its full length can go all the way up to nine feet. Because it is a retractable pole it can work for most people from short to tall. This is a great pole to through in the back of your truck or in a camping bag, it is very lightweight so you will barely even notice that you are carrying it with you. This pole comes in at a carbon fiber content of 98%. 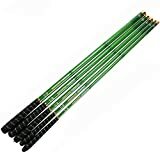 This makes the pole offer a really high amount of flexibility, but it does not crack under small amounts of stress like some other cheap telescopic fishing poles. The pole was very comfortable to hold, the material made it very easy hold without my hand cramping up or becoming irritated. This rod will not come with a reel, but for such a good price you can not really expect it to come with one. This is a very inexpensive pole for the quality it offers, so it does seem fairly reasonable to not come with a reel. It fits most standard spin reels and the reel is very easy to put on. Even though it will fit most reels, it is better suited to use one ten pounds or under. It can still function with a heavier one, but for optimal performance, the lighter reels will give it a better feel. Everything on this pole fits tightly and feels very well constructed, so there should be no fear of snapping. because of how well this pole can keep up with better ones. I do think that this is one of the higher quality telescopic poles you can get for the price. It can compete with some of the hundred dollars and up poles. 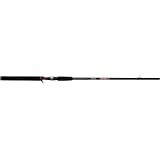 It is a great pole to start with for someone that travels a lot, or enjoys hiking to their fishing destinations. Even if you are already an avid fisherman and you have plenty of expensive poles, this is great to throw in a travel bag so that you can always pull over when you see a fishing spot from the side of the road, and due to the price, you never have to worry too much about it getting lost by the TSA while flying or dropping and damaging it. Fishing is a sport which requires the best tools whether it is for recreational purposes or catching your dinner. Where you want to use your fishing rod would also entail what kind of fishing gear you would need. While there are numerous of options out there, the Sougayilang 1.8m-3.3m spinning rod and reel combos carbon telescopic fishing rod with reel combo for saltwater and freshwater fishing is a product that stands out. Let’s take a closer look. Just looking at the Sougayilang 1.8m-3.3m spinning rod you can tell that it was made with quality in mind. And because it is of great quality, the manufacturer recommends using it in both saltwater and freshwater fishing. This is a good thing as there are some rods which only allow for a certain type of water, limiting what you can do with it and giving you the added cost of buying another rod and hauling them with you when you do go out to fish. Some fishermen would be happy to know that this fishing rod is made from carbon fiber. While the carbon fiber material does offer durability and strength, the downside to it is that it is not that sensitive and most experts recommend using that kind of material on a rod that will only be used for deep water fishing or when you want to catch a weighty fish. When are reeling in the fish, you won’t have to worry about the rod breaking off on you because even when you have hooked a large fish, the carbon fiber allows it to flex without having to snap on you. Once you get a large fish biting, you are sure to reel it in, confident that your tool is strong enough to handle the intense bout. If there was one thing to point out with this Sougayilang fishing rod, it would be the fact that it has a collapsible handle. This means you can easily interchange it to suit your preference, whether you are right-handed or left. This kind of feature is what makes fishing much more accessible to those who would otherwise be uncomfortable with the traditional setup. For those who are looking for a fishing rod that is the “one,” this just might be it as you can easily use this in any type of water. Whether you are fishing on freshwater rivers and lakes, or to the salty seas and the ocean, you will be able to reel in a fish easily. This is a huge plus as this will permit you to just bring one rod with you, not to mention the fact that your fishing experience will be a lot simpler and easier. And you also don’t have to worry about the rod’s lifespan shortening on you when you use it on either types of water as it is quite durable. There really aren’t many negative things to say about this Sougayilang fishing rod. In fact, it is close to perfect. If you are a fisherman who wants a rod that is all-in-one, then this is one of the best rods on the market. Fishing rods are often hard to take with you to trips as their sheer length make them next to impossible to fit in your car. When fishing rods do disassemble, you run the risk of losing the different parts which will lead to an unusable rod. People who love to fish are always in the lookout for a rod that will make their life so much easier. Could the Sougayilang carbon spinning telescopic fishing rod be the one for you? The first thing that you should know about this Sougayilang fishing rod is that it can drastically change your life in terms of taking it with you to your trips and getaways. This is because it is lightweight, compact, and is fully extendable, so you won’t be concerned about the rod snapping off on you because of mishandling it or losing different parts because there are no parts to disassemble. Its portability will permit every family member to have one and bring them with you in your trips easily. Despite being compact, lightweight, and extendable, it is quite strong and durable. Reeling in and catching large and heavy fishes will not be a problem at all; in fact, you just might find it a lot easier to catch fishes with this rod. And just because it is compact, lightweight, and extendable does not mean it sacrifices on its performance; in fact, this rod has a long reach which allows for deeper depths. Deeper depths mean bigger fishes. The rod itself is flexible so you won’t have to worry about it breaking on you, so you can reel in those large fishes confidently. Just like other fishing rods of Sougayilang, this rod also has a collapsible handle so those who are left-handed can also use it. 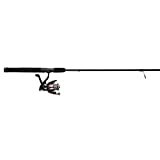 Another noteworthy feature of this rod is its handle, which some brands don’t give any attention to, as it is rubberized providing more comfort and a better grip. If there was something to nit-pick with this fishing rod, it would be the material it is made out of. Being made from carbon fiber does give it strength and durability, but unfortunately it does not give it the sensitivity like that of rods which are made from fiberglass. And because it is made from carbon fiber, this Sougayilang fishing rod is much more suited for fishing in saltwater; but of course, it can also function on freshwater, though its performance will be a bit subpar compared to fishing in saltwater. Expert fishermen will surely notice the difference in sensitivity, but that does not mean you won’t be able to catch a fish in freshwater rivers and lakes. Competitors might just want to select another rod for shallow freshwaters. People who love sailing off to the sea and fishing on their boats will surely get a kick from this rod as both beginners and experts alike will find it easy to catch a fish. It must be pointed out that this rod does have its slight restrictions but it is pretty user-friendly and in what it can do, it does so pretty well. Anyone looking for the best telescopic fishing rod, this is worth a shout. When it comes to fishing rods, there are so many makes, models, and styles available in the market. There are so many to choose from when you finally decide to buy. For the beginner, and sometimes intermediate fishing enthusiast, this is usually a daunting task considering the information and jargon that is part and parcel of the fishing process. The first step taken when making any kind of decision is to do your homework. Ask yourself the following questions. What will be the main use of the fishing rod? Your fishing rod will most likely have a main use. To better help you in deciding the main use for your fishing rod, consider the following aspects. Fishing is a multi-generational past time. A fishing rod will have to fit the user. The age bracket within which the intended user represents will largely determine the size of the rod. Shorter rods which are light are the best fit for children as they usually do not have the strength required to handle a standard-sized rod. For an adult, the options are very wide and your personal preference is usually the basis underlying the decision. As with every other sport and activity, there exists two main categories of participants – the die hard participant and the casual participant. The amount of fishing activity vary greatly between these two groups. Determine how much fishing you plan to carry out as this will determine your Fishing rod choice to a great extent. This will also determine the fishing rod’s price tag. 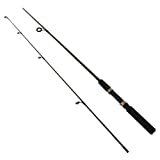 For the die-hard fishing enthusiast will require a high quality fishing rod. The rod will have to be reasonably to extremely moderate as it will help it endure the strain of continuous fishing. These kinds of fishing rods are usually moderate to expensive when it comes to cost. Buying a similar rod for a casual angler can be either overkill or a time conscious decision. It can act as an investment as the rod will last a very long time when used casually. The only downside is that it can leave a dent in your pocket. Where do you plan on fishing? Special jigs are required for ocean-based fishing. This is because the fish tend to be larger and will require a durable fishing rod. Oceans also have raging currents which increase the drag when you’re casting the line or reeling in the catch. This is too much strain for a normal fishing rod. Lake side (covers rivers and streams) or dockside fishing do not require anything top of the line or fancy in nature. A simple fishing rod is usually enough to make you a fishing pro on such fishing grounds. What is the size of your target catch? Do you plan on going after fish that can match a 5 year old in size or moderately sized fish? Bigger fish will require fishing rods of unmatched strength. Reasonably-sized fish will require lighter rods as they won’t require as much strength to catch. What material would you require your fishing rod to be made of? Fishing rods are made using two types of materials. Each material has its fair share of advantages over the other. They work well under different conditions and will turn you into a failure of a fishing enthusiast when used in the wrong conditions. Sensitivity is a key aspect when fishing. As you learn the practice of fishing, you get a practiced affinity towards sensitivity at a certain level. This helps you know when the fish has bitten your bait. Preference to various levels of sensitivity is more of a personal choice rather than an industrial standard. If you would like to use live bait and prefer a high level of sensitivity when fishing plus the advantage of catching large fish, then the Graphite fishing rod should be your first option. Receiving high acclaim for its flexibility, this material is used when using heavy flat lures. This is a technique commonly called crank-baiting. These rods are usually made of fiberglass ir a mix of both fiberglass and graphite. These rods are straight just like graphite rods but have the added advantage of increased durability. This rod lacks the sensitivity level brandished by the graphite fishing rod. Your budget is the deciding factor when it comes to a multitude of activities today. “How much can I set aside for the fishing rod of your dreams?” should the question to ask yourself if you’re after top quality top results fishing rods. This applies to a great extent to fishing enthusiasts planning on fishing a lot. Rods used by this category of fishing enthusiasts will always be above the average pricing model. It is a price that has to be paid to achieve your goals. For the casual angler, a modestly priced rod will be enough to greatly enjoy your fishing excursions. Try your best not to go for fishing rods that are priced way below the average price category. The result will be expensive as they will not last as long as you may have intended. Cheap is usually expensive. One thing to keep in mind is that you shouldn’t have to break the bank when it comes to setting your budget. Buy what will work for you as there is usually an option available. The dawn of the internet and social media is the best thing that ever happened to you as a fishing enthusiast. The days of going out and buying every type of fishing rod as per your requirements just to find out the ‘perfect fit’ are long gone. Rather than being the guinea pig, you can learn from other users. Details on experiences while using various fishing rods, to estimated durability and general advice from industry veterans and professionals are right at your finger tips. Perform a quick search online for reviews on the fishing rod that you are interested in and use them to help you make a decision. The final decision will and should always be yours. Know one knows whats your best fit apart from you. Use this guide as a starting point and make sure to have fun while fishing. ATTENTION TO DETAIL - KastKing uses the best quality components in KastKing Perigee II fishing rods. World renowned Fuji O-Ring line guides, tuned ergonomic graphite high-strength reel seats, high-density EVA grips, Saf-T-Keeper hook holder, the finest sensitive "bare and beautiful" finish carbon fiber for rod blanks, and outstanding cosmetics. SENSITIVE & STRONG, KASTFLEX BLANK - All Royale Legend one-piece and two-piece fishing rods are constructed with Toray 24-ton carbon matrix KastFlex technology blanks which gives each rod incredible sensitivity and power. Laser focused manufacturing techniques ensure the highest quality and consistency to deliver the performance that serious Bass anglers expect. FUJI LINE GUIDES - We use only high-quality Fuji O-ring guides for superior casting distance and accuracy while dissipating heat more efficiently which delivers excellent durability with monofilament, fluorocarbon and braided lines. Reel seats are made of high-strength nylon for a solid base and all-day comfort. 1 PC Bass Technique Lengths & Actions - Every Royale Legend casting and spinning rod is designed with the bass angler in mind. Each rod has been developed to help you be more successful no matter which technique you use most often from Flippin' to Drop Shot, Texas Rigging, Swimbaits and much, much more. You'll find a rod perfect for everything you do.